1. Play a command card. 5. Draw a new command card. Play one command card from your hand. The card will tell you in which section(s) of the battlefield you may issue orders and how many orders you may give. Some cards allow you to take special actions, as explained on the card. Announce which of your generals and/or units you will order. Only those ordered figures may move, battle, or take a special action this turn. You can’t give more than one order to each general or unit. 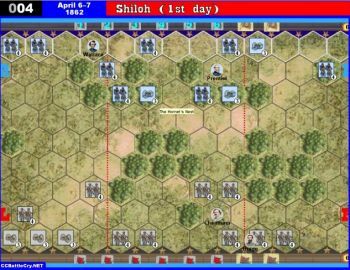 Infantry — An ordered infantry unit may move 1 hex in any direction and battle. Cavalry — An ordered cavalry unit may move up to 3 hexes in any direction and battle. Artillery — An ordered artillery unit may move 1 hex in any direction or it may battle. An artillery unit may not move and battle. General — An ordered general may move up to 3 hexes in any direction. When alone, a general may not battle. A unit may move only once per turn. A unit that is ordered doesn’t have to move. A unit may move from one section of the battlefield to another. A unit may not move onto or through a hex occupied by a friendly unit, an enemy unit, or an enemy general. You may move a unit onto a hex occupied by a friendly general if the general is alone in the hex. The unit stops there and may move no further that turn. The general is then attached to the unit. You may not split a unit. The individual figures within a unit must stay together and move as a group. Units that have been reduced through casualties may not combine with other units. Aside from special rules, a unit may not exit the battlefield. A general may move only once per turn. A general that is ordered doesn’t have to move. A general may move from one section of the battlefield to another. A general may move through a hex occupied by a friendly unit, a friendly unit with an attached general, or a friendly general that is alone in a hex. A general may end its movement in a hex occupied by a friendly unit as long as there is no other general in the same hex. The general is then attached to the unit. 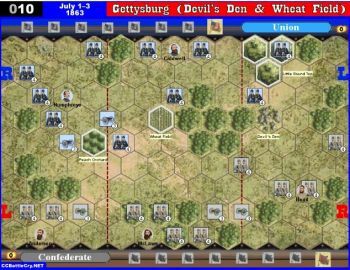 A general may not move onto or through a hex occupied by an enemy unit or general. Aside from special rules, a general may not exit the battlefield. A general in the same hex as a friendly unit is “attached” to the unit. Only one general may be attached to a unit. If a unit with an attached general is given an order, the general must move with the unit to the same hex. The movement of the unit and attached general only counts as one order. You may give an order to an attached general to move away from the unit that it’s attached to for a cost of one order. The unit that the general moves away from is not ordered unless it is also given an order. A general may move away from one unit and attach to another, but the unit it attaches to is not automatically ordered. A general that moves and joins a unit may not move again with a unit it has just joined. Note: Retreating is a different type of movement with slightly different rules. See Retreat, pg. 11. A unit may battle only once per turn. You must resolve each battle before starting the next. A unit may never split its battle dice between several enemy targets. If a unit is adjacent to one or more enemy units, it may not attack a more distant enemy. The number of playing pieces in a unit has no effect on the number of battle dice rolled. Casualties do not affect the number of battle dice rolled by a unit. As long as one playing piece remains, a unit battles at full strength. 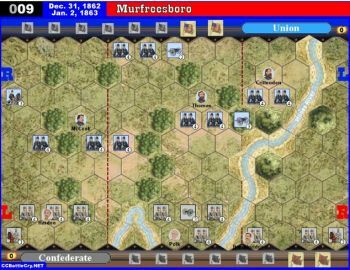 Embolden Troops: Each time a unit with an attached general is attacked, that unit may ignore one retreat flag rolled against it. 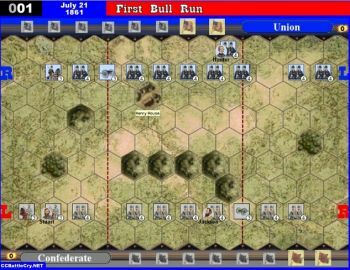 Take Ground: An attached general and the infantry or cavalry unit to which it’s attached may “take ground” after battling an adjacent enemy unit that is eliminated or that retreats from its hex. The unit with the attached general takes ground by moving onto the hex that was occupied by the enemy unit. A general’s ability to take ground overrides terrain features that require a unit to stop and move no further on the turn. A unit with an attached general may not take ground after using the Fight Back card. Each time a general that is alone in a hex is attacked, that general may ignore one retreat flag rolled against it. A general alone in a hex may not battle. A general attached to a unit will not normally add any battle dice to a unit when it is battling. Determine the range (distance to the enemy target). Determine the line of sight (whether or not you can see the target). Roll the dice (to determine hits, retreats, and misses). 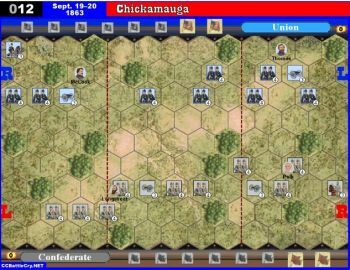 Infantry — Range of 4 hexes. An ordered infantry unit may battle an enemy target that is 4 or fewer hexes away in any direction. An infantry unit rolls 4 battle dice when the target is in an adjacent hex, and 1 die less for each additional hex away from the enemy. For example, to battle an enemy that is 4 hexes away in clear terrain, an infantry unit would roll 1 battle die. Artillery — Range of 5 hexes. An ordered artillery unit may battle an enemy target that is 5 or fewer hexes away in any direction. An artillery unit rolls 5 battle dice when the target is in an adjacent hex, and 1 die less for each additional hex away from the enemy. For example, to battle an enemy that is 5 hexes away in clear terrain, an artillery unit would roll 1 battle die. Cavalry — Range of 1 hex. An ordered cavalry unit rolls 3 battle dice, but may battle only an adjacent enemy target. 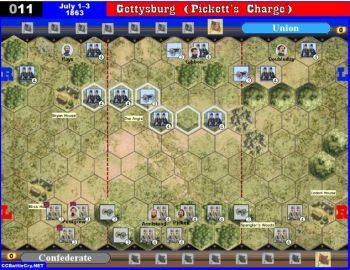 See Generals in Battle, pg. 9. A unit must be able to see the enemy unit it wants to battle. This is known as having line of sight to the enemy. Imagine a line drawn from the center of the hex containing the battling unit to the center of the hex containing the enemy target. This line of sight is blocked if a hex (or part of a hex) between the battling unit and the target hex contains an obstruction. Obstructions include a unit or general (regardless if friend or foe) and some terrain. (See Terrain, pg. 12.) The terrain in the target hex does not block line of sight. If the imaginary line runs along the edge of 1 or more hexes that contain obstructions, line of sight is not blocked unless the obstructions are on both sides of the line. “A” may not fire at “C” because the woods hexes are on both sides of the imaginary line between the hex centers. This leaves no part of the enemy’s target hex visible. “A” may not fire at “D” because the imaginary line between their hex centers passes through the woods hex, thereby blocking line of sight. “A” may not fire at “E” because the imaginary line between their hex centers passes through part of the woods hex, thereby blocking line of sight. If “E” moved 1 hex forward, then “A” would have a clear line of sight. Determine the number of battle dice a unit will roll because of range. Reduce the number of dice when targeting a unit on terrain. Add to the number of dice for any command card effects. 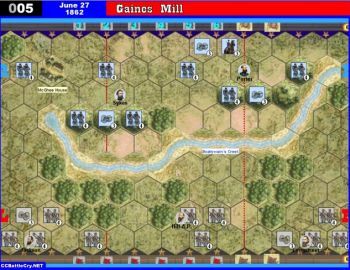 Example: You play a Leadership tactic card and order an infantry unit with an attached general that is targeting an enemy infantry unit 2 hexes away on a woods hex. First, determine the dice to be rolled based on range, 3 dice, then deduct the woods protection of –1 die, which equals 2 dice. Then add the Leadership bonus of +1 die for a total of 3 dice. Once you’ve determined how many battle dice to use in a battle, roll the dice. Each die rolled will result in a hit, a retreat, or a miss. Hits are resolved first, followed by retreats. The attacker scores one hit for each symbol rolled that matches the target unit. The attacker also scores a hit for each sabers symbol rolled, regardless of the type of unit attacked. For example, a targeted infantry unit suffers 1 hit for each infantry symbol and 1 hit for each sabers symbol rolled. For each hit scored, remove one figure from the target unit. Remove the flag bearer piece last. When the flag bearer (last piece) in the opponent’s unit is removed, place it on an empty star of the victory stand on your side of the battlefield. If an attacking player rolls more hits than the number of playing pieces in the defending unit, the additional hits have no effect. A general may only be attacked and hit when alone in a hex. When attacking a general, calculate the number of battle dice to be rolled as usual. The attacking player must then roll at least one sabers symbol. If the roll succeeds, the defending general is eliminated. When you eliminate a defending general, place it on an empty space of the victory stand on your side of the battlefield. 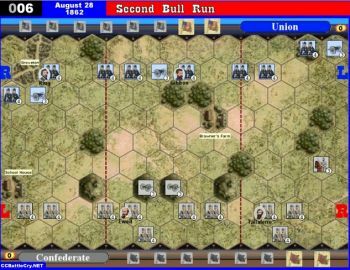 Play a command card that orders at least 2 units that are within range and line of sight of the defending general’s unit. First roll the appropriate dice to completely destroy the attached unit. Then, another unit must attack the lone general and roll a sabers symbol to score a hit and eliminate the general. After you resolve all hits and remove casualties, then resolve retreats. For each flag symbol rolled during the battle, the defending unit must retreat 1 hex toward its own edge of the battlefield. Terrain has no effect on retreat moves; therefore, a retreating unit may move through terrain that normally would stop movement. Impassable terrain, however, may not be moved through during a retreat move. A unit may not retreat onto or through a hex that contains another unit. Exception 1: A unit, without a general attached, may retreat onto a hex that contains a friendly unattached general. 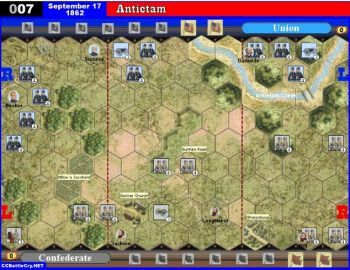 If a unit retreats onto a hex with a friendly general, the unit must stop and the general attaches to that unit. The unit will ignore any other retreat flag symbols rolled by the attacker and may not retreat any further. Exception 2: A general may retreat through a hex with a friendly unit or general. A general may retreat onto a hex that contains a friendly unit as long as the unit does not already have an attached general. After completing all retreat moves required, if the general is in a hex with a friendly unit, it is considered attached to that unit. Any unit on a hex that a general passes through during his retreat move is unaffected. 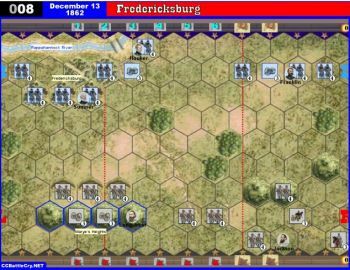 A unit with an attached general may not retreat onto a hex that contains another friendly general. 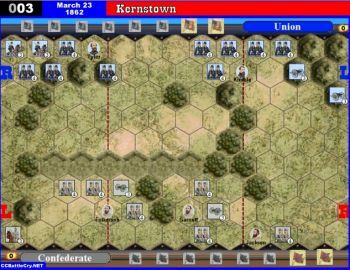 An attached general must retreat with its unit to the same hex. If the unit is eliminated in battle, the general must make any retreat moves required. 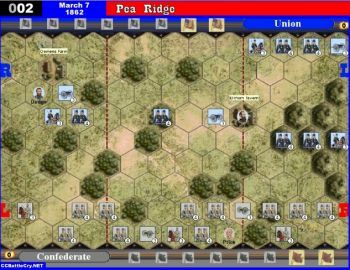 If a unit can’t retreat because of reaching the edge of the battlefield, or if other units (friend of foe) or impassable terrain blocks the retreat, the player of the retreating unit eliminates one figure in the retreating unit for each retreat flag move that can’t be completed. Such losses may include an attached general if there are no other figures available to be taken as casualties. If a general can’t retreat because of reaching the edge of the battlefield, or if enemy units or impassable terrain blocks its retreat, the general is eliminated. You failed to roll any of the symbols needed to hit an enemy target or to force the enemy to retreat. After resolving all hits and retreats, discard the command card that you played and draw another card from the deck. Your turn is now over.